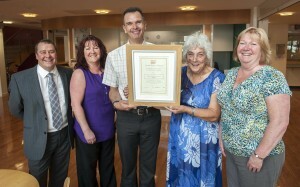 Knowsley Council’s Independent Living Services has been presented with a Good Service Award by KOPV (June 2012). The Good Service Award – an initiative from Knowsley Older People’s Voice rewarding individuals or agencies providing exemplary service for older people in the borough – has been won by the team in recognition of their work in developing Extra Care Housing projects in Knowsley. This is only the third occasion that the award has been presented.